“I believed I would preach God’s word on TV one day. I didn’t look for opportunities, I sought after God and waited for His timing”, says Pastor Vahan from Turkey. Beyond the Veil is the realisation of Pastor Vahan’s 15-year-old prayer and dream – to bring the transformative message of God’s love to the people of Turkey. 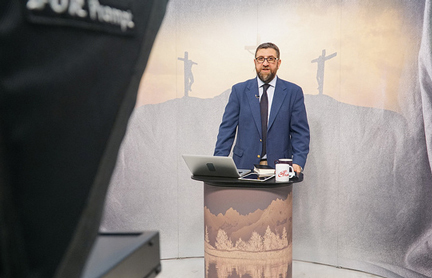 Through SAT-7 TÜRK, he can now speak to millions of potential viewers and address difficult biblical questions and concepts. Using his own experiences, struggles, and insights, Pastor Vahan lends a personal approach to Bible teaching. “I love to discover what is behind the curtain”, he says, his face radiating with excitement. Now that one dream has been fulfilled, Pastor Vahan has big visions for the future. Pastor Vahan knows that people are watching his program. While walking down the street he is being recognised. Chance encounters with an electrician, who called out to Pastor Vahan and said ‘Hey brother! Great program!’, and a food delivery guy, has left Pastor Vahan feeling surprised and encouraged. Even the mothers at his daughter’s school recognise him and ask questions. Beyond the Veil has a wider viewership than he expected. Not limited to viewers in Turkey, Turkish speakers write encouraging words, blessings, and questions from across Europe. Through programs like Beyond the Veil, SAT-7 TÜRK is working to bring about a positive change in people’s lives through Christ’s transformative love.